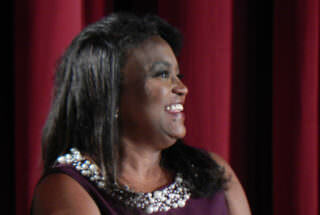 Michelle King announced the new graduation rate on Tuesday. LA Unified is heading faster than expected toward the stated goal of 100 percent graduation, with a surprise announcement at Tuesday’s school board meeting that the district hit an 80.2 percent graduation rate for the 2016-17 school year. That’s more than a year ahead of the aggressive graduation growth that Superintendent Michelle King had planned. She had set a goal of 79 percent for the 2017-2018 school year and 81 percent for the following year. At the beginning of her report at Tuesday afternoon’s board meeting, King announced, “We have topped 80 percent graduation” after counting all the graduates who fulfilled their credit recovery courses over the summer and met their graduation requirements. The graduation rate is up three points from last year. The previous year it jumped five percentage points, from 72 percent in 2015. LA Unified’s graduation rate may rise again when the state releases its official rates. In the past, it has been higher than what LA Unified reports, as the state has better tracking information. In April, when the state released its graduation rates for 2016, it reported LA Unified’s was 77 percent, a 2 percentage point increase from the district’s preliminary projection the previous August and its biggest jump in seven years. The statewide average graduation rate for the 2015-16 school year was 83.2 percent, barely 1 percentage point higher than the previous year. The district has not yet tabulated how many students needed credit recovery courses to graduate, said Chief Academic Officer Frances Gipson. Preliminary data over the summer from the district showed that 55 percent of the Class of 2017 received a C or better in all of their college prep classes known as the A-G coursework. The University of California and California State University systems require at least a C in all of these classes to be eligible for acceptance onto their campuses. That figure did not include any students who might have graduated meeting the requirements this summer. Gipson said the final A-G figure for the class of 2017 was not yet available. Rodriguez and other board members have said they would like to see all graduates achieving C’s or better in their required courses. But that would mean a hit to the district’s progress with its graduation rate. Gipson pointed to a resolution proposed by Kelly Gonez, which “is in complete alignment with the district’s goals and bringing out another public commitment that supports our graduates,” Gipson said. The school board unanimously passed Gonez’s resolution aimed at ensuring all graduates are college- and career-ready. The resolution, co-sponsored by George McKenna and Richard Vladovic, directs the superintendent to collect data on student outcomes. Gonez said bringing the data together will help the district assess how prepared LA Unified graduates are. The district’s college-going rate fell last year, according to a data analysis from the National Student Clearinghouse obtained by LA School Report. A recent study by the Los Angeles Education Research Institute and UCLA found that almost 70 percent of LA Unified graduates in 2008 began college, but only one-fourth of them earned a college degree after six years. “We are not where we want to be when it comes to college readiness,” Gonez said. Gonez’s resolution, which was passed on consent, asked that the district compile reading and math scores from third through eighth grades, SAT scores, pre-school performance, and how many completed federal student financial aid forms, among other data. *This article has been updated to correct the source of data on last year’s decline in LA Unified’s college-going rate.